This is to announce a new Winston Graham and Poldark website. I’ve wanted to do this for a couple of years since my blog postings, first the Poldark novels, then on Winston Graham and Cornwell, then on historical fiction, especially 18th century and Cornish, and then on Winston Graham’s other novels — began to mount up. I had first to ascertain that I was not duplicating what someone else had done. I explored the two online Winston Graham websites and discovered they are commercial, set up by Pan Macmillan; the purpose is to sell books and there is no information on Graham’s life, very little about the individual books, or historical or Cornish fiction. There are 3 factual wikipedia articles (on Graham, more briefly on the Poldark novels and on the mini-series) and I found one excellent account of the first series of Poldark films (1975-6), but these leave much room for discussing this worthy body of work (but see comment on an online literary society). Graham reminds me of Trollope: both have legions of readers; Graham’s Poldark novels have never fallen out of print, yet they are neglected by academics & magazine people alike. I am doing what I can (adding my mite) on the Net to end that. I’ve written one paper, intend to write more, perhaps papers, or an article intended for serious readers who are yet not academics, and maybe even a fiction of my own. I just love many of his characters and his English style progressive stance, his descriptive abilties, his accurate portrayal of Cornwall circa later 18th into early 19th century. So I’ve put together what I have made so as to share. accompanied by a working bibliography. I know I’ve put most of my blogs on Graham on my Ellen and Jim have a blog, two blog. All the more reason to alert those interested in the 18th century, in feminist writing (even by men) and historical fiction. 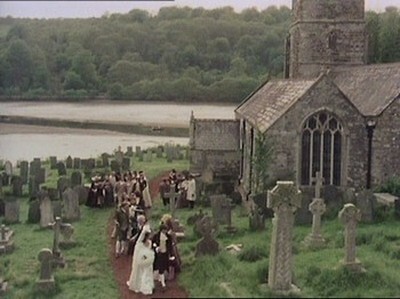 Graham imitates Austen scenes: in Ross Poldark, the rivalry for musicianship beween Demelza and Elizabeth at the close of the book recalls the rivalry of Jane and Emma in Emma; in Demelza the way the doctor-surgeon, Dwight Enys is confronted by Caroline Penvenen’s wealthy uncle and holds his own is a counterpart of Elizabeth versus Lady Caroline de Bourgh. I hope eventually to extend this site to include more historical novels set in the 18th century which have a strongly progressive point of view, more Cornish fiction and to write more on the film adaptations of these and Graham’s Poldark novels. There is more but these must suffice for a short blog.